What better way to get up to speed on cloud computing than with this new book in the popular Sybex Essentials series? Cloud Essentials covers the basics of cloud computing and its place in the modern enterprise. Explore public and private clouds; contrast the "as a service" models for PaaS, SaaS, IaaS, or XaaS platforms; plan security; and more. 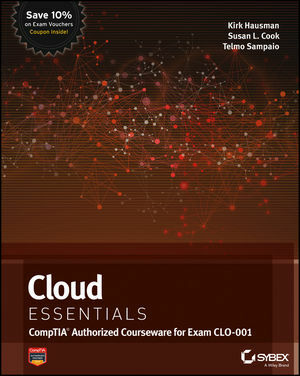 In addition, the book covers the exam objectives for the both the CompTIA Cloud Essentials (Exam CLO-001) exam and the EXIN Cloud Computing Foundation (EX0-116) certification exams and includes suggested exercises and review questions to reinforce your learning. Kirk Hausman is an adjunct professor for the University of Maryland and Assistant Commandant for IT, PR, and Strategic Communications for Texas A&M University. He has been an ISO and director of IT services for numerous sectors, including sustainable energy technologies. His professional certifications include PMP, CISSP, CISA, CISM, CGEIT, and CRISC. Susan L. Cook is an IT manager at Texas A&M University, specializing in enterprise risk assessment and compliance. She has master's degrees in information technology and security management and holds several IT certifications, including CIS and CRISC. Telmo Sampaio is the main trainer at MCTrainer.NET, his own training and consulting company. He travels the world educating Microsoft employees and partners on different technologies, including cloud computing.